Hidden and not so dangerous. A hundred people are set loose on an island full of guns, and the last person alive wins. 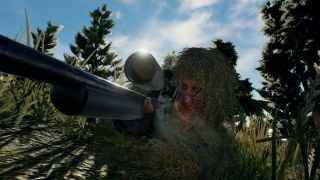 That’s the beautifully simple premise of PlayerUnknown’s Battlegrounds, an Early Access shooter that has sold over two million copies and is currently the third most-played game on Steam after Dota 2 and Counter-Strike: Global Offensive. It’s rough around the edges and there’s plenty of room for improvement, but even in this early work-in-progress state it’s the most fun I’ve had in an online game in years. Read our recommended loot spots in PlayerUnknown's Battlegrounds. It took a while to fall in love with it, though. At first I was treating it like an enormous deathmatch, tooling up with whatever guns I could scavenge and actively seeking out other players to kill. I thought this would be the fastest, most efficient way to climb to the top of the food chain. But then I remembered that I’m horrible at multiplayer shooters. I suffered death after unceremonious death, kicked backed to the menus just minutes into a match, before deciding that I’d have to adopt a new approach to succeed. And so I chose the way of the coward. I started playing Battlegrounds like a stealth game, staying alive by staying out of trouble. I’ll still pick up weapons when I find them, but I’ll only attack someone if A) it’s in self defence or B) they leave themselves open to an easy kill. And when you’re crawling through the grass and cowering in the shadows, it’s amazing how many players turn their backs to you, completely oblivious to your presence. But sometimes I’ll let them pass. Gunfire will attract other players, so it’s usually safer to just hole up somewhere and wait for them to move on. But if I’m hiding in a building and I hear a door open (I always close them behind me) I’ll locate a small room with no windows, point my gun at the door, and wait patiently. Hearing someone’s footsteps in the house as they loot the place, knowing they could come through the door at any moment, is thrilling. And they almost always do, earning me an easy kill. But Battlegrounds has some tricks up its sleeve to deal with players like me. Not only is the play space constantly getting smaller, represented by a steadily shrinking circle on the map, but random, terrifying airstrikes will occasionally pummel the area you’re in. This means that as comfortable and secure as a hidey-hole might be, you will eventually have to move. And it’s when you’re traversing open country that you’re the most open to attack. Most of my deaths have occurred while searching for a new hiding spot. I love sneaking in games, and playing Battlegrounds this way has all the tension of a Deus Ex or Metal Gear Solid, but with real, thinking humans as opponents instead of AI-controlled guards. And outwitting an actual person is so much more satisfying. But it does mean that my heart is constantly pounding when I play, and the relentless tension—especially when I reach the top 20—is exhausting. This is not a game I play to relax. By the time you reach the top 10 the play area contracts to the size of a Quake multiplayer map. The remaining survivors are squeezed together, and this is when things get really tense for those who’ve chosen the coward’s path. But if you manage to remain concealed, it’s possible to win the match by patiently waiting for the other survivors to kill each other. I’ve yet to achieve this myself, but for me this would be a much more satisfying victory than winning through combat. And I’ll keep playing until I’ve done it at least once. I’ve experimented with other cowardly ways of staying alive. In one match I made it to the top 10 by sitting in a boat under a bridge. In another I drove a buggy in circles and came 7th. Neither were as enjoyable as creeping around the map like Solid Snake, but I’m having fun experimenting and seeing what works and what doesn’t. There’s no prescribed way to play the game, and I love that about it. How you survive really is up to you. I’ve played Battlegrounds in an aggressive group of four, engaging other squads in firefights at every opportunity, and it’s a lot of fun. But I much prefer playing solo, seeing how long I can last through sheer tenacity and cunning. And the very fact that I can is, I think, part of the reason why the game is such a success. It’s a great story generator and there are a lot of ways to play, whether you’re the forceful, competitive type, or a complete coward. They say fortune favours the bold, but in my experience the bold largely end up dead, so I think I’ll stick to shivering in the bushes, thanks.